The 9th Annual Sports Shooter Contest was judged on April 7, 2007. The judging panel of Wally Skalij (Los Angeles Times), Myung Chun (Los Angeles Times), Matt A. Brown (Los Angeles freelance photographer), Sean Haffey (San Diego Union-Tribune), Jack Gruber (USA TODAY) and Robert Hanashiro (USA TODAY) spent an evening at Sports Shooter Academy IV working to decide the winners in the contest. The entire judging was open to spectators at Sports Shooter Academy IV in Southern California. The contest was made possible by donations from Robert Distributors, Versa-Flex and Samy's Camera. 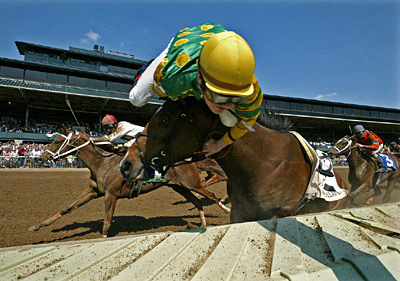 Lexington, KY - 4/28/2006: Jockey Julien Leparoux tries to hold on to his reins as he is catapulted over the head of his mount, Sanibel Storm, after the filly hit the rail while leading the sixth race in her career debut at Keeneland Race Course on April 28, 2006. The horse and rider were uninjured. 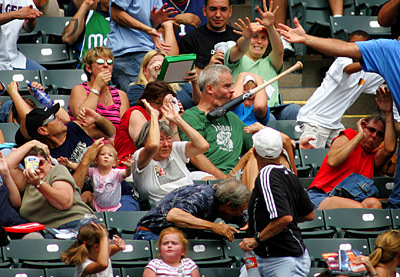 A bat slips from the grasp of Indians player Kelly Shoppach (not pictured) and flies into the crowd, striking a fan during Sunday's Rangers game in Arlington. The Cleveland Indians played the Texas Rangers at Ameriquest Field in Arlington, Texas Sunday September 3, 2006. 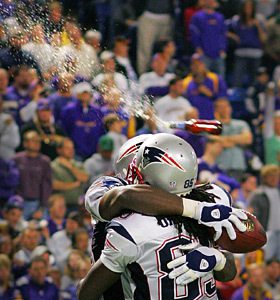 Minneapolis, MN 10/30/2006 Minnesota Vikings -vs- New England Patriots - A beer bottle flies past the heads of Patriots #84 Benjamin Watson as he celebrates with teammate #85 Doug Gabriel after scoring on a 9 yard catch in the endzone from Quarterback Tom Brady. The drunken fan was found and escorted out of the Metrodome. 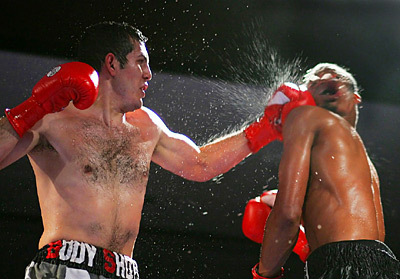 Ontario, Ca - 10/16/2006; Danny Garcia left, applies a vicious left jab to Derek Andrews in the third round. Andrews went on to win a unanimous decision in the 6 round contest. 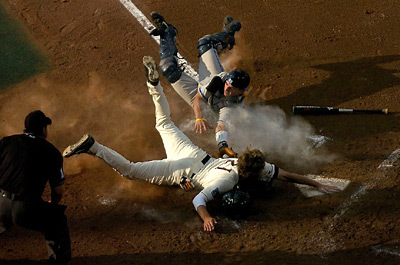 Tyler Graham slides safely into home past UNCs' Benji Johnson as Oregon State takes the lead in the final game of the College World Series Championship series at Rosenblatt Stadium on June 26, 2006. Park City, UT- 2/04/06: Mushers compete in the 11th annual International Pedigree Stage Stop Sled Dog Race in Park City, Utah. "This is it. 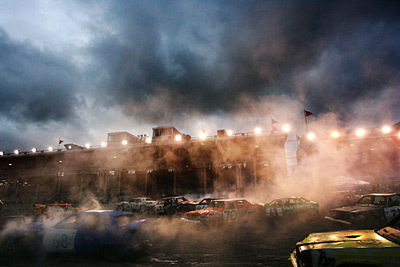 this is the grand finish. This is my last professional race," said Charlie Boulding, top, who placed 11th overall. "So, if I'm back next year you can call me a liar." 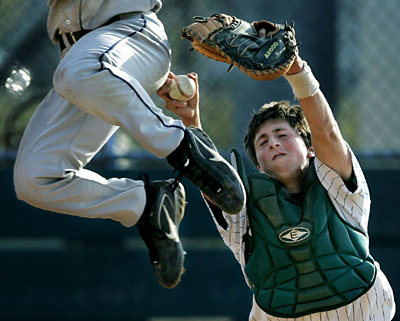 Chaparral High catcher Mark Duchesne holds onto the ball after tagging out leaping Vista Murrieta High's TS Read who tried to score from thirdbase on a shallow pop-fly ball to rightfield in the 9th inning of the game in Temecula, CA. 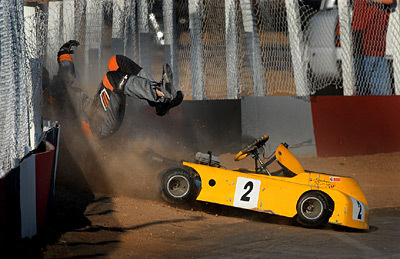 Dec 31, 2006; Deer Valley, AZ, USA; Go kart racer Ryan Amigliore is ejected from his kart after crashing into the wall during the final race of the 2006 Holiday Classic at AKA Speedway in Deer Valley, AZ. Amigliore was unhurt in the incident. Minnepolis, MN-11/24/06: Stephen-Argyle's (MN) Kyle Pietruszewski carries teammate Kolby Gruhot's prosthetic leg off the field for repairs after it detached during a play in the second half of their Minnesota Class A championship game at the Metrodome in Minneapolis, November 24, 2006. 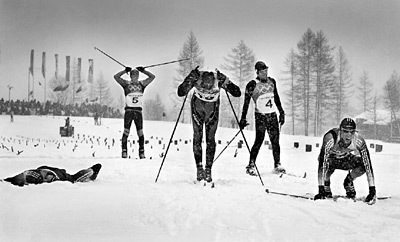 Hovhannes Sargsyan (ARM), Helio Freitas ((BRA), Alen Abramovic (CRO), Danny Silva (POR), Valts Eiduks (LAT), from left, at the finish line after competing in the Mens Cross Country Skiing 15km Interval Start Final of the 2006 Turin Winter Olympic Games on February 17, 2006 in Pragelato Plan, Italy. 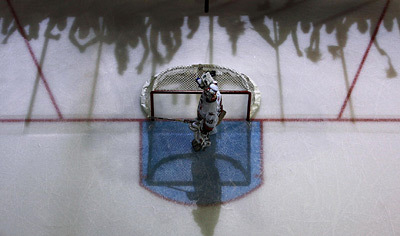 Edmonton, AB - 6/17/2006: Celebrating fans cast shadows on the ice as Carolina Hurricanes' goalie Cam Ward takes a drink of water after Edmonton Oilers' Fernando Pisani (not pictured) scored the team's first goal of the game during the second period of play in game 6 of the NHL Stanley Cup Final series in Edmonton, Alta., on Saturday June 17, 2006. The Oilers won the game 4-0 to force game seven. 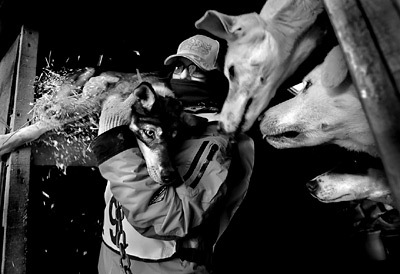 Jackson Hole, WY- 1/29/06: Musher Katie Davis works to get her racing dogs out of the truck before the start of the 11th annual International Pedigree Stage Stop Sled Dog Race. 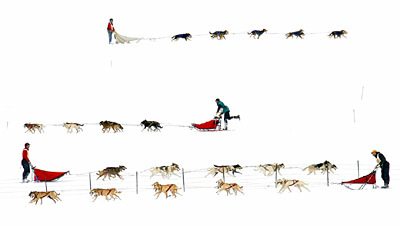 Twenty-two mushers from around the world competed in the 9-day competition that started in Jackson Hole, Wyo., and ended in Park City, Utah. 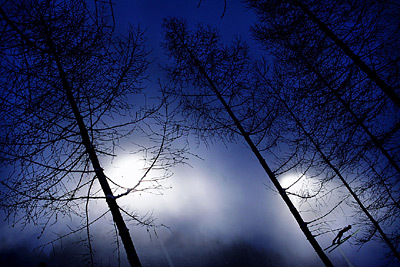 Pragelato, Italy- 2/20/2006: On a foggy night in Pragelato, Austria's Andreas Widhoelzl sails down the hill during the 1st round of the 2006 Winter Olympics Men's Long Hill Team Ski Jumping Competition. Widhoelzl and his Austrian teammates would go on to capture the gold medal. 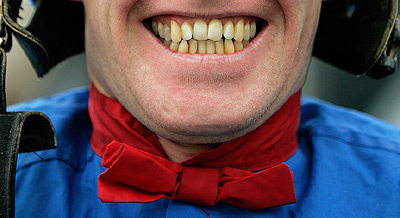 James Graham, a horse Jockey, smiles after winning a race on opening day at Churchill downs in Louisville KY. Jockeys earn around 8 percent of the overall profit from a single win. 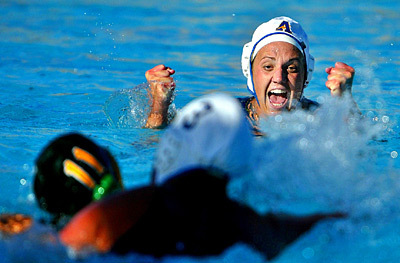 Oxnard, CA - 02/28/06: Meghan Corso of Agoura Hills reacts as a team mate scores the second goal for them during their CIF-SS championship game against the Santa Barbara Dons on Tuesday, Feb. 28, 2006 at Rio Mesa High School in Oxnard, Calif.
Champaign, IL - 10/1/2006: Illinois' Ella Masar is kicked in the face by Penn State's Heather Tomko during the game at Illinois Soccer Stadium in Champaign, Ill., on Sunday, Oct. 1, 2006. Tomko recieved a personal foul for the kick, but Masar was not hurt. During the game, Masar scored two goals, helping No. 15 Illinois defeat No. 9 Penn State, 3-2.